Sign up for CDAA Spring Classes! Sign up for a full session, there is still time! Sign up this week and receive a prorated session. At CDAA your workout is creative and fun! Come fly with us!! Check out our Spring Schedule on our website! 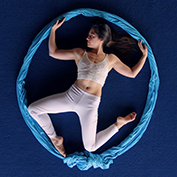 Aerial Lab, Aerial Performance Workshops, Aerial Yoga, Beginner Aerial Technique, Harness Dance Technique & Performance Workshops, and Youth full session classes. 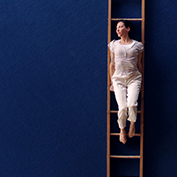 Students from the Performance workshops will be performing In Mystery Blue on May 16th, 2015. 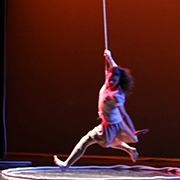 This 4-week workshop is designed to introduce students to the basic fundamentals of harness-based aerial dance. Students will focus on single-point suspension. Each session will introduce principles related to safety, stamina, floor and wall-based flying and repelling. Courtesy of Zaccho, all harness-based equipment will be provided. Participants should bring layers of clothing that will go under the harness. Students who participate in this workshop are encouraged to enroll in the subsequent Harness Dance Performance Workshop. This class is designed for youth with previous experience in acrobatics. 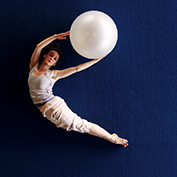 Work alongside Zaccho Youth Company and perfect your acrobatic skills! This class helps you build strength and coordination, and will take your acrobatic technique to the next level. Join us for an exciting new workshop series that will culminate with the first student performance at Zaccho's Center for Dance and Aerial Arts! 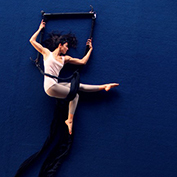 This workshop will focus on building solos and duets on a wide variety of aerial equipment. Learn about act creation, music, lights, costumes and stage presence. Take your aerial practice to another level this Spring! Students will add the cutting-edge combination of aerial acrobatics and dance in their routine! On low flying apparatus, students will explore movement techniques that help to build their confidence in the air. This class incorporates strength, flexibility and a lots of hanging upside down!